According to leading experts, city and town centres across the UK can become safer places for both pedestrians and motorists if spaces are freely shared between the two. Through stripping central roads of markings and signs, it’s been discovered that a driver’s vigilance is optimised to their surrounding environment, consequently reducing collisions and injuries. In 2013 alone there were over a 1000 collisions in the Somerset region, with over 1500 casualties and 28 proving fatal. 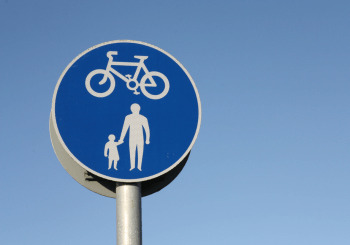 Pedestrian casualties rose by 23% and those on a cycle by 26% last year, showing a potential need for a shared space initiative in those areas deemed suitable. Through the removal of confusing signage and road markings in piloted areas throughout the UK, bustling intersections have been transformed from often congested and hostile environments to freer flowing traffic successes. Subsequently, once jeopardised retail areas have been given a boost, allowing the local economy to thrive again. Naturally, concerns remain about the lack of structure to traffic flow with feared “chaos” ensuing, although fundamental High Way code rules remain including giving way to the right and urban speed limits. Universal support is still a long way off, with a petition for the removal of shared space in central Gloucester gaining momentum as locals continue to worry about the impact of both domestic and foreign tourists and the understanding of who has priority, causing confusion on the roads. Also, with the removal of curbs, pedestrian crossings and traffic lights, those with visual impairments are often left in a precarious situation without the usual physical identification points on the street. With shared zones often relying on the ability to quickly adapt and react to a changed environment, those with disabilities may find it difficult to initially cope, placing them in danger. It is likely to remain uncertain as to whether shared spaces will fully catch on throughout the UK and until they do, confusion surrounding how they work and their debated benefits for lowering congestion will remain a motoring hot topic.